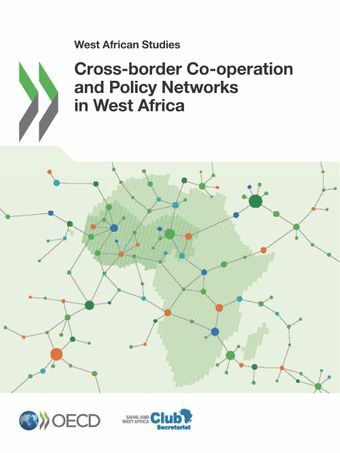 This publication examines how policy actors involved in cross-border co-operation contribute to the regional integration process in West Africa. It uses a pioneering methodology, known as social network analysis, to visualise the formal and informal relationships between actors involved in cross-border policy networks, showing that borders have notable and diverse impacts on exchanges of information and the relative power of networks. 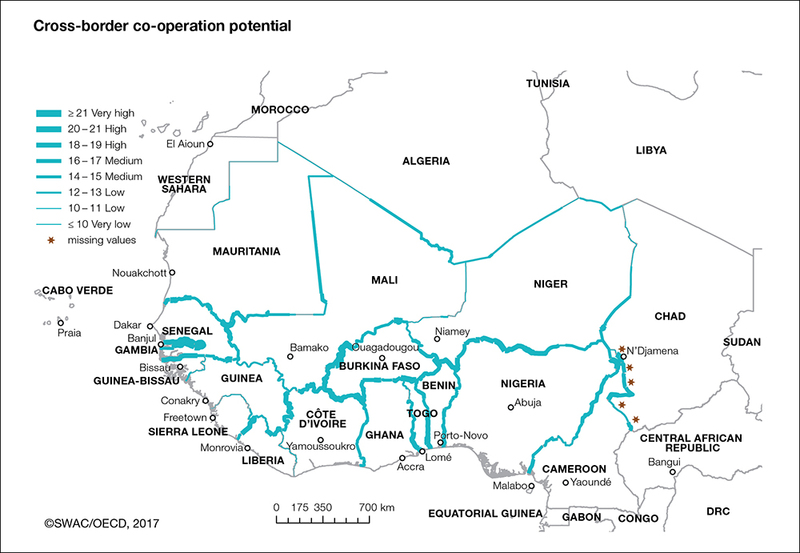 The report then analyses a range of regional indicators of co-operation potential, visually demonstrating that borders can also affect the ability of sub-regions within West Africa to develop cross-border initiatives in a number of ways. Combining these two analyses with the perceptions of regional policy makers as to which border areas they consider as priorities for regional integration, the publication concludes with the analytical foundations for more effective place-based policies that can enhance cross-border co-operation in West Africa. The report contains innovative analyses of the co-operation potential of West African regions, the structure of its cross-border policy networks, and the spatial vision of its political actors . Collectively, these analyses enrich the readers understanding of the vital role border areas have in contributing to the regional integration process. 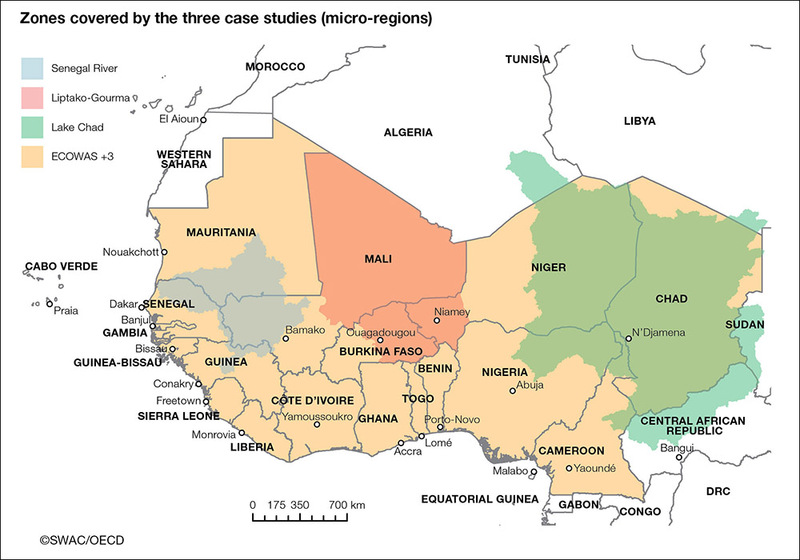 The study was conducted at the West-African regional level and in three areas: (1) Senegal River – crossing Senegal, Mauritania, Mali and Guinea, (2) Liptako-Gourma – covering the adjoining areas of Mali, Burkina Faso, and Niger, and (3) Lake Chad – from Niger and Nigeria to the west and Chad, Sudan and the Central African Republic to the east. The publication first assesses the extent to which economic, political and social disparities are a source of synergies or barriers to cross-border co-operation. The analysis focused on seven indicators: population, water resources, agricultural and pastoral resources, languages, status of borders, political stability and poverty. 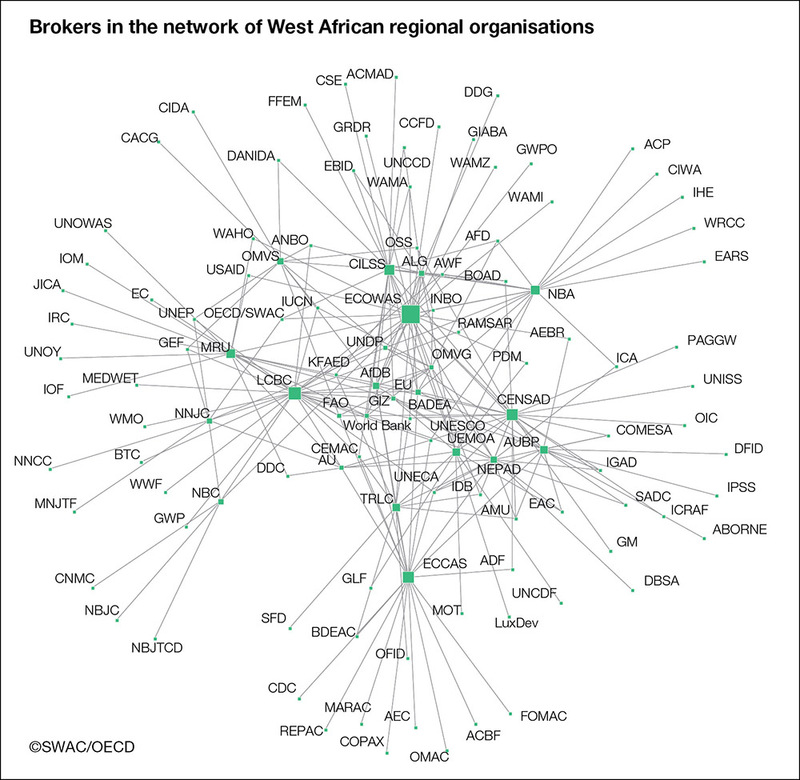 Taken together, these indicators provide information about which areas of West Africa have the greatest potential for developing cross-border co-operation; these are represented where the blue lines are thickest. 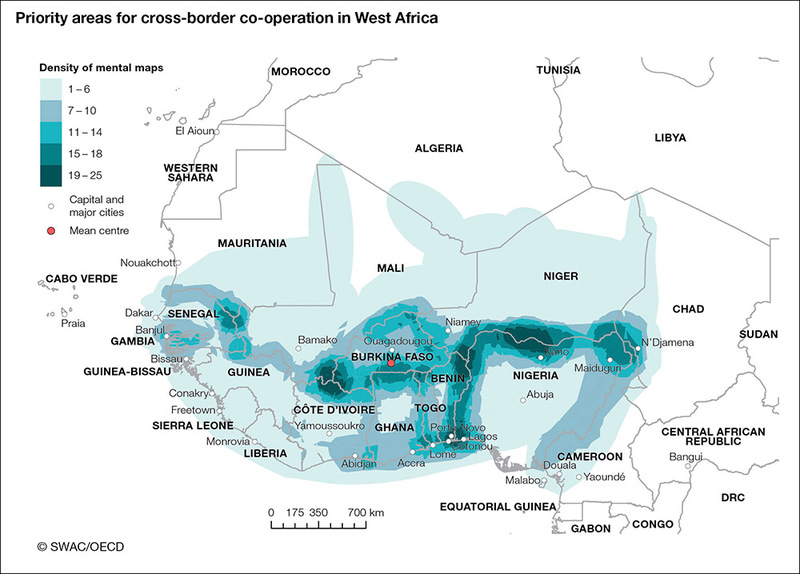 The mapping of the combined cross-border co-operation potential confirms the spatial heterogeneity of the West African region as the thick lines are unevenly distributed through the territory. 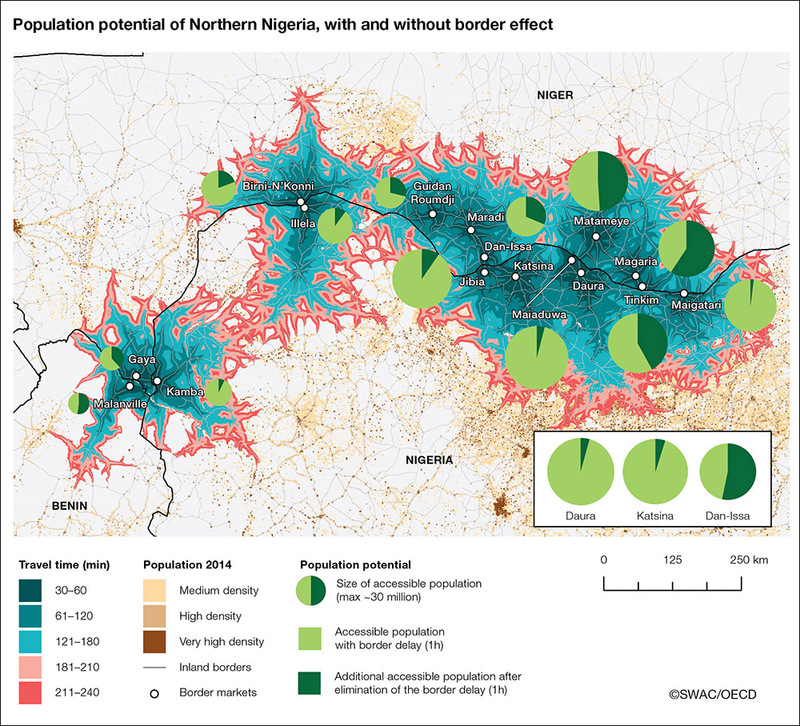 This map focuses on one of the indicators (population potential) within the Niger-Nigeria border area). Analysing the population potential of an area makes it possible to spatialise the current and potential geographical limits of socio-economic interactions. The region is particularly conducive to cross-border co-operation, due to the large network of cities and markets located on both sides of the border that provide opportunities for cross-border commerce. The model used calculates the number of inhabitants located within four hours of a border market, taking into account the quality and quantity of road networks, land cover and the presence of borders. The shortest journey times are shown in dark blue and the longest in pink. Furthermore, it is also able to calculate the population that could theoretically reach a market if border delays were reduced by one hour (identified by the dark green in the pie-charts). The greater the dark green area, the more the market has to gain from improving border efficiency. The considerable diversity of actors involved in cross-border co-operation and their complex relationships can be visualised using social network analysis, which maps out the relationships between actors and measures their influence. The network of cross-border co-operation organisations closely resembles a core-periphery structure in which the core actors prefer to interact with other core actors, while actors on the periphery do not interact with each other but rather with the core of the network. The diagrammatic map illustrated here, known as a "mental map", is the result of a survey based on a sample of 137 actors involved in cross-border co-operation. These actors were asked to map out the space they consider to be a priority area for cross-border co-operation on a topographic map. The maps were then superimposed to determine if there is consensus over where policy co-operation should take place. In the Senegal River valley, there are different interpretations of the perimeter of cross-border co-operation. The actors do not agree on the centre of activity, with some locating it in the river valley and others between Mali and Burkina Faso. In the Liptako-Gourma region, actors agree on both the perimeter and the centre of cross-border co-operation. 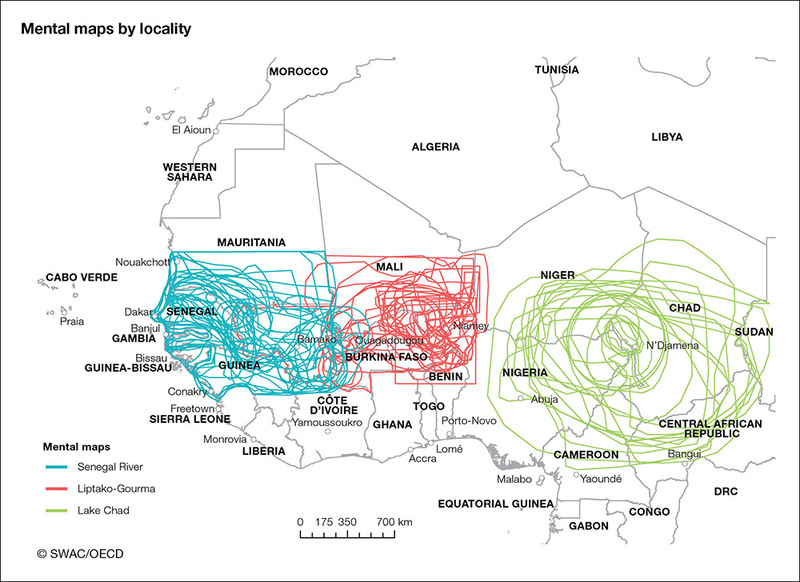 The mental maps show concentric circles organised around the area that traverses Burkina Faso, Mali and Giver. In the Lake Chad basin, stakeholders agree on the centre of cross-border co-operation, but not on its boundaries. The maps show concentric circles based on N'Djamena but their geographical reach varies greatly, going as far as the Central African Republic, southern Cameroon and central Niger. In general, the emergence of a consensus on the extent of cross-border co-operation is a sign of the maturity of local governance systems. Actors have had time to build and share a common vision of areas where cross-border co-operation should take place. This map identifies the priority areas for cross-border co-operation in West Africa based on the survey respondents' mental maps. The darker the colour, the greater the consensus over the zone's importance for cross-border co-operation. The priority areas recognised by a high proportion of respondents are the Lagos-Cotonou conurbation, the Hausaland, Dendi (Gaya-Malanville-Kamba), northern Togo (Sinkansé, Burkina Faso) and the Sikasso-Korhogo-Bobo Dioulasso (SKBo) triangle. Three of the five regions are located around the perimeter of Nigeria.